One of the most vicious diseases that infects students across the country every summer is known as “the summer reading slide.” Out of school for over 100 days, many students will opt to avoid books like the plague. Daily reading is like daily exercise: small doses can often lead to very favorable long-term benefits. By not using their “reading muscles,” non-reading students suffer atrophy, which inevitably puts them behind their classmates who continued to read during their vacation. Parents play an integral role in immunizing their children from this dreaded condition. 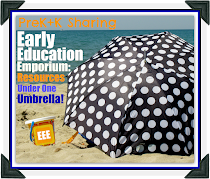 www.reading.org/Resources/Booklists.aspx. 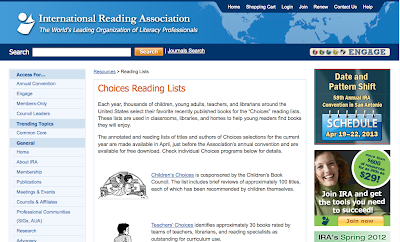 “Children’s Choices” is co-sponsored by the International Reading Association (IRA) and the Children’s Book Council (CBC). Thousands of children, young adults, teachers and librarians around the United States select their favorite recently published books for the annual list. You can also find plenty of good book picks in IRA publications like Reading Today or on the CBC’s website (www.cbcbooks.org). www.ala.org/ala/mgrps/divs/alsc/awardsgrants/notalists/ncb/index.cfm. The American Library Association maintains a lot of valuable book recommendation databases based on a number of criteria. 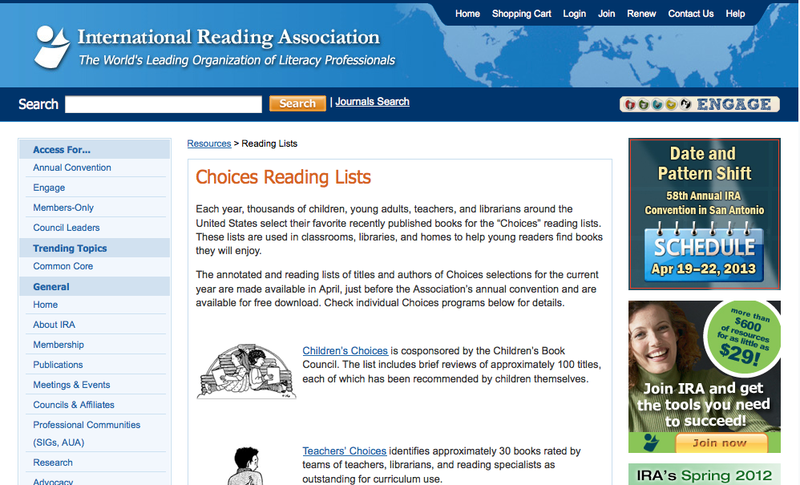 Each year a committee of the Association for Library Service to Children (ALSC) identifies “notable” children's books, thought to include books of especially commendable quality, books that exhibit venturesome creativity, and books of fiction, information, poetry and pictures for all age levels (birth through age 14) that reflect and encourage children's interests in exemplary ways. According to ALSC policy, the current year’s Newbery, Caldecott, Belpré, Sibert, Geisel and Batchelder Award and Honor books automatically are added to the Notable Children’s Books list. For your convenience, Notable Children's Books that have also received other ALA awards, such as the Coretta Scott King Award, Michael L. Printz Award, Alex Award and Schneider Family Book Award, are also noted on this list. Don’t worry – the site also explains what each of these awards specifically honors. www.neh.gov/projects/summertimefavorites.html. Summertime Favorites, a list of recommended readings, represents the National Endowment for Humanity’s (NEH) long-standing effort to highlight classic literature for young people from kindergarten through high school (Diary of a Wimpy Kid creator Jeff Kinney humorously defines a “classic” as a book that is at least 50 years old where someone dies). Thousands of parents and teachers have used Summertime Favorites since 1988 as a supplement to school reading lists to emphasize the value of reading classic books. www.nea.org/grants/13235.htm. Developed by the National Education Association, a popular activity for students on this site is to “travel” across a map of the United States by reading a book that takes place in each of the states (a variation is to read a book whose author lives in a particular state, or a book about a particular state). This list includes fiction and non-fiction titles for younger to older readers. www.parents.com/fun/entertainment/books. 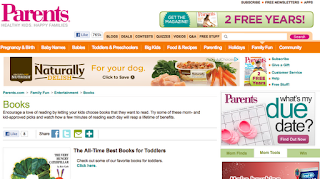 Sponsored by Parents magazine, these numerous lists prompt parents to encourage a love of reading by letting kids choose books that they want to read. Written for parents and compiled by moms and children, these lists are conveniently arranged by age groups (toddler-preschool, ages 4-8 and ages 9-12). 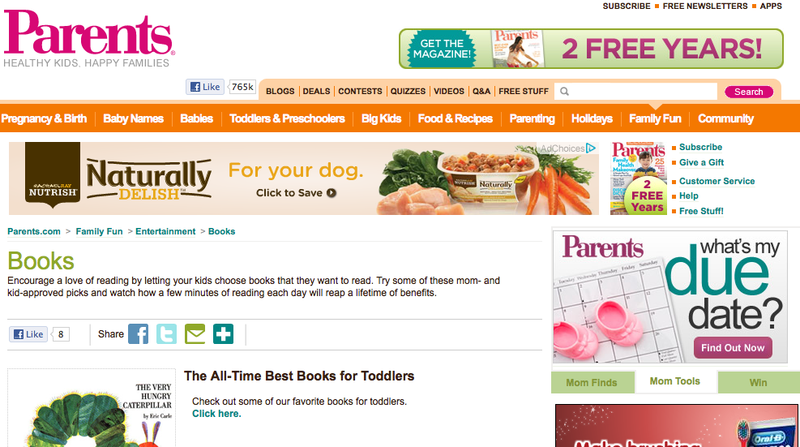 While all of these sites are fabulous, who are the most difficult people to excite about reading? Inevitably, boys are much more reluctant readers than girls. 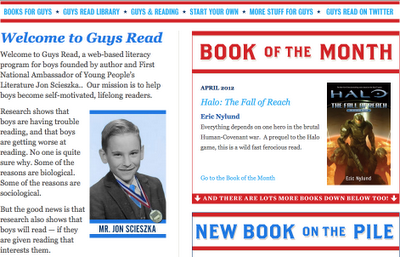 So some of my favorite sites to send parents and teachers to in search of good book recommendations specifically for boys include www.booksforboys.com, www.boysread.org and popular children author Jon Sciezka’s www.guysread.com. Even though Congress recently pulled their funding, Reading Is Fundamental (RIF) has maintained one of my favorite websites, www.rif.org. Yes, RIF features lots of recommended books for children of different ages. What sets this site apart, however, is that students alone determined the book recommendations included on this site. I have examined a lot of studies of children’s reading habits, and it has always amazed me that reading lists developed by adults for kids and those developed by kids themselves are very different. What is even more amazing is that the lists developed by kids usually include books that, on average, are written at a higher level than the ones adults choose. Don’t underestimate children’s reading interests and abilities. 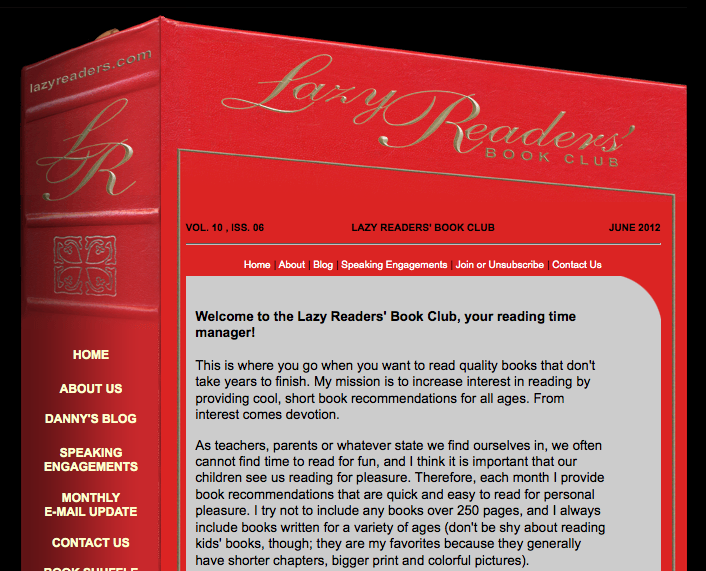 Finally, www.lazyreaders.com is considered to be “the best” resource for parents, teachers and students to draw ideas for summer reading ideas. 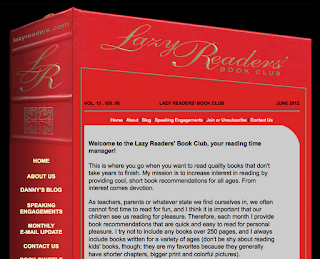 Okay, for the sake of transparency, I created the site for “The Lazy Readers’ Book Club” nearly ten years ago. I developed the site to provide cool, short book recommendations for folks who did not feel like they had enough time to read in their daily lives. The site has taken on a life of its own, as students – particularly middle-school boys – flocked to the site to find short book picks for their book reports. As a result I posted a number of free vocabulary games on the site, and if visitors follow book links from the site to Amazon, the online bookseller donates up to 10 percent of every purchase to BookEnds, a charity created by an 8-year-old kid that creates classroom libraries in under-resourced areas (to date, they have already enrolled over 250,000 student volunteers to lead book drives and donated over 2 million books to schools, group homes and other facilities). The point is that no student should suffer in school because he failed to practice reading over the summer. 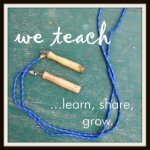 Practice makes permanent, and the best way to create permanent practice is to build on the interests of your child. As a parent, you can spark this interest by surrounding your child with reading materials she likes and encouraging her to read as a daily habit. 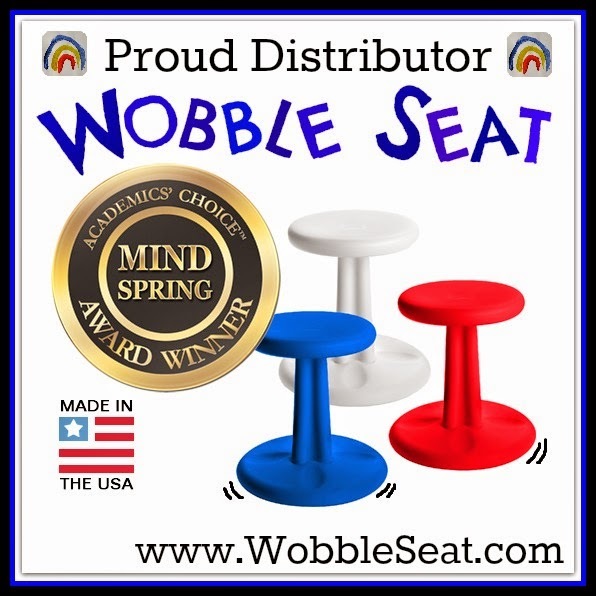 You are the most important teacher and role model your child will ever have, so please help your child avoid the summer reading slide by actively engaging your child with wonderful reading materials every day this summer. Danny Brassell, Ph.D., is “America’s Leading Reading Ambassador,” helping parents and educators inspire kids to love reading and achieve more. A father of three and professor in the Teacher Education Department at California State University-Dominguez Hills, he is the founder of The Lazy Readers’ Book Club, www.lazyreaders.com, Google’s #1-ranked site for cool, “short book recommendations” for all ages. 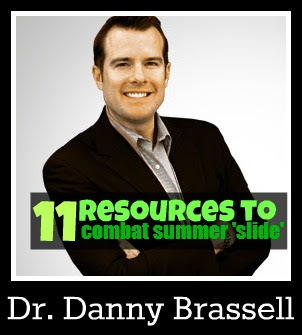 Watch video tips and learn more from Danny at www.dannybrassell.com. Finally, someone that explaines Feedreads so that even I can understand it! It﻿ works! And i think this A brilliant tutorial THANK YOU!